Come see the all-new Honda Passport near Atlanta, Georgia. This rugged Honda SUV is packed with convenient features. With seating for five, ample cargo space, underfloor storage compartments and a folding 40/60 split rear seatback, the Passport can transport you, your family and your gear, comfortably. The new Honda Passport is powered by a powerful V-6 engine with 9-Speed automatic transmission and paddle shifters. It offers up to 5,000 pounds of towing capacity and has an available Intelligent Traction Management System with Snow, Mud and Sand Modes. Buy or lease the Honda Passport at our Ed Voyles Honda dealership. Easy and convenient Honda financing and leasing is available in our Honda finance center. We can also help you find new Honda specials and any factory incentives or lease deals offered. 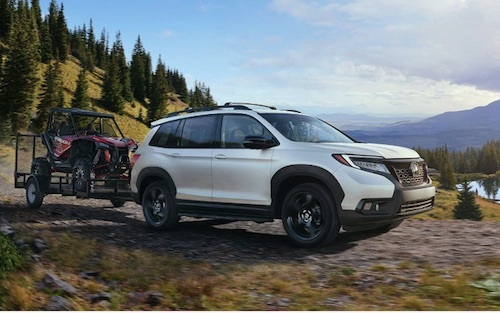 See our full inventory of new Honda Passport models online, compare prices, vehicle details, color options and trim levels. We invite you to stop by and meet the new Honda Passport near Atlanta, GA.